CUTPRO: TAP TESTING MODULE (MALTF) – MAL Inc. The CutPro® Tap Testing Module is a versatile transfer function measurement program, which has been tested and optimized for National Instruments data acquisition systems (PCI, PCMCIA & USB). The transfer function measurement is performed with impact hammer tests. The results from these tests can be displayed in different formats and saved to be imported into modal analysis software. After performing a series of impact hammer tests, the resulting transfer function will be displayed on the screen. Various display options can be changed during and after the impact hammer tests to alter the way in which the information is displayed on the screen. The transfer function itself can be viewed in magnitude-phase mode, or alternatively in its real and imaginary components. The linear parts of the transfer function can be viewed as linear or logarithmic values. 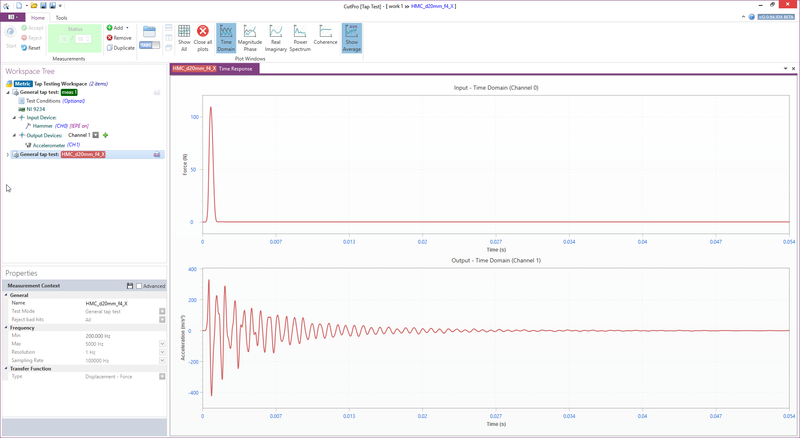 To check the validity of the results, the input signals can be viewed in the time domain, or as a frequency spectrum. In addition, the transfer function can be saved in binary format and opened with all measurement settings at a later time.